Rotherham United’s Good Friday game at the Liberty Stadium against Swansea City sees Keith Stroud of Hampshire in the middle. The Millers and Keith last met in October at St Andrew’s Stadium when a Lukas Jutkiewicz hat-trick gave Birmingham City all three points although Jon Taylor did get a consolation for the visitors. The only yellow of the afternoon went to Joe Mattock. Before that Keith was in charge of a Millers game in January 2017 for our South Yorkshire derby with Barnsley at the New York Stadium, the only goal of the game coming on seventy minutes from Adam Armstrong for the visitors. Joe Mattock for the hosts and Barnsley’s Ryan Kent saw yellow that day. The time before that when Keith was in the middle for a Rotherham game was five months earlier at Villa Park. The game was a three-nil win for the hosts with six yellow cards being shown – two of those to Joe Mattock and sub Darnell Fisher. Keith had the whistle for three Millers games the previous season, the first time being in September at the Valley against this weekends opponents Charlton Athletic. The game was a one-all draw that afternoon with Farrend Rawson giving the visitors the lead in the first half but Patrick Bauer got an equaliser for Charlton on sixty-five minutes. That day Keith booked two players from Charlton plus Danny Collins and Joe Newell of the Millers. He was also in charge of our one-nil win over Leeds United when Joe Newell won all three points for the visitors with a goal on fifty-four minutes. Twenty minutes later both teams were down to ten men after a coming together of Leon Best, who was making his debut for Rotherham, and Gaetano Berardi with both getting their marching orders. Both players got a three match ban though on appeal Berardi had his reduced to two. The last time was at the end of January when Charlton were at the New York Stadium. Simon Makienok opened the scoring for the visitors on just four minutes with Chris Burke getting an equaliser seven minutes later before Igor Vetokele put Charlton back in front a minutes before the half ended. Another goal from Makienok plus one in the final minute of the game from Ademola Lookman which was his first touch of the game having just come off the bench, gave the visitors a four-one win. Keith has been in the middle for a few Millers games in the past and before this season the last one was in December 2014 at the DW Stadium. Tom Lawrence gave the Millers the lead five minutes before the break but on sixty-four minutes Ben Watson equalised for Wigan. But the hosts joy lasted less than a minute with Alex Revell getting all three points for the visitors. Scott Wootton, Paul Green, Tom Lawrence and Paul Taylor were all booked that afternoon. He was also the man in the middle for our home leg of the League One Play-Off against Preston North End in May 2014. Paul Gallagher put Preston in front on sixteen minutes but first half goals from Wes Thomas and Lee Frecklington and a Kieran Agard goal on the sixty-seventh minute gave the Millers a three-one win on the night and a four-two win on aggregate. Adam Collin and Wes Thomas saw yellow on the night for the Millers with Bailey Wright, Kevin Davies and Gallagher getting booked for Preston. The twice before that Keith was in charge of Millers games was firstly a Friday night game at Sixfields in April 2011. Rotherham went ahead on five minutes when a Nicky Law shot hit the Cobblers Paul Rodgers and flew into the back of the net and on the stroke of half-time Ryan Taylor made it two-nil. With the Millers on top the home side were awarded a free-kick which Michael Uwezu took and his shot hit the foot of the post and rebounded to Leon McKenzie who toe-poked the ball over the line. In the dying minutes of the game the action was all centered around Jamie Annason’s goal and after a shot headed off the line and another that went wide Liam Davis got an equaliser in three minutes of time added on. February 2010 Keith took charge of our game against Burton Albion at the Pirelli Stadium where Adam Le Fondre got the only goal of the game to give the Millers all three points. Not without controversy Keith was in the limelight when he reffed a game between Newcastle United and Burton Albion, giving a penalty to the hosts which they scored he then disallowed the goal and gave a free-kick to Burton for encroachment when the Laws clearly state that the penalty should have been taken again. He was also on the end of Neil Warnock’s wrath in February when he disallowed a Cardiff goal bringing the ball back for a free-kick to them instead of allowing play to go on. 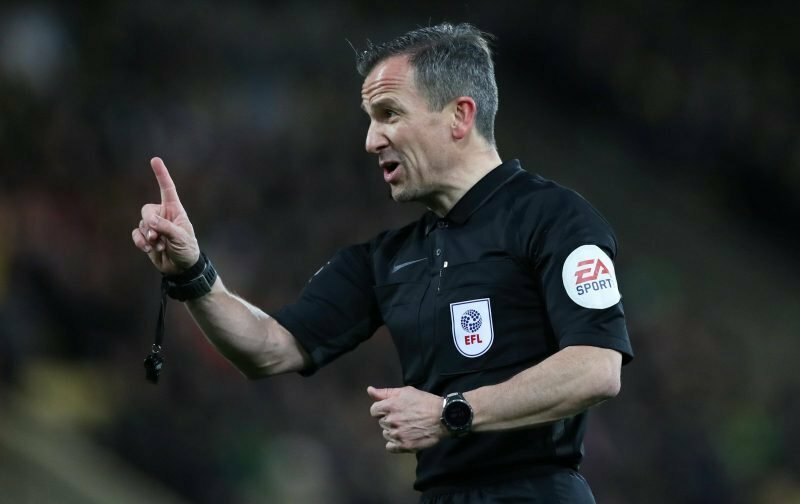 In the twenty-six games Keith has officiated this season he has shown eighty-five yellow cards and three red cards. Running the line on Friday we have John Flynn and Daniel Leach with John Busby as the Fourth Official.